HOL-OCL is an interactive proof environment for the Object Constraint Language (OCL). It is implemented as a shallow embedding of OCL into the Higher-order Logic (HOL) instance of the interactive theorem prover Isabelle. HOL-OCL is developed by Achim D. Brucker and Burkhart Wolff. HOL-OCL allows one to reason over OCL specifications, refine OCL specifications, and builds the basis for further tool support, e.g. for the automatic test-case generation. Frédéric Tuong and Burkhart Wolff. A Meta-Model for the Isabelle API. In Archive of Formal Proofs, 2015. Achim D. Brucker, Matthias P. Krieger, and Burkhart Wolff. Extending OCL with Null-References. In Models in Software Engineering. Lecture Notes in Computer Science (6002), pages 261-275, Springer-Verlag , 2009. Selected best papers from all satellite events of the MoDELS 2009 conference. Achim D. Brucker and Burkhart Wolff. 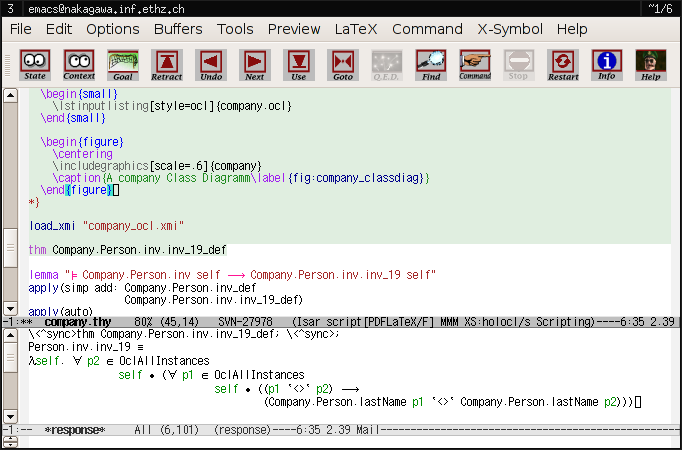 HOL-OCL - A Formal Proof Environment for UML/OCL. In Fundamental Approaches to Software Engineering (FASE08). Lecture Notes in Computer Science (4961), pages 97-100, Springer-Verlag , 2008. Achim D. Brucker and Burkhart Wolff. Extensible Universes for Object-oriented Data Models. In ECOOP 2008 - Object-Oriented Programming. Lecture Notes in Computer Science (5142), pages 438-462, Springer-Verlag , 2008. Achim D. Brucker, Jürgen Doser, and Burkhart Wolff. A Model Transformation Semantics and Analysis Methodology for SecureUML. In MoDELS 2006: Model Driven Engineering Languages and Systems. Lecture Notes in Computer Science (4199), pages 306-320, Springer-Verlag , 2006. An extended version of this paper is available as ETH Technical Report, no. 524. Achim D. Brucker and Burkhart Wolff. Using Theory Morphisms for Implementing Formal Methods Tools. In Types for Proof and Programs. Lecture Notes in Computer Science (2646), pages 59-77, Springer-Verlag , 2003. Achim D. Brucker and Burkhart Wolff. HOL-OCL: Experiences, Consequences and Design Choices. In UML 2002: Model Engineering, Concepts and Tools. Lecture Notes in Computer Science (2460), pages 196-211, Springer-Verlag , 2002. Achim D. Brucker and Burkhart Wolff. A Proposal for a Formal OCL Semantics in Isabelle/HOL. In Theorem Proving in Higher Order Logics (TPHOLs). Lecture Notes in Computer Science (2410), pages 99-114, Springer-Verlag , 2002.